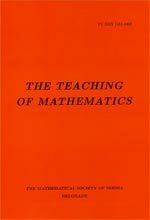 THE TEACHING OF MATHEMATICS started in 1998 as a separate volume of Nastava Matematike , a pedagogical journal in Serbian, which has been edited since 1952. The Teaching is exclusively research oriented. All contributed papers containing essentially new ideas and techniques relevant for teaching of mathematics at all levels, recommended by our referees, will be considered for publication. In particular, the papers containing subject analysis of selected teaching themas and new ways of their modelling will be welcomed. The languages of this Journal are the congress languages of the International Mathematical Union. This journal approves and supports the International Mathematical Union's Best Current Practices for Journals (2010) and Code of Practice (2012) by European Mathematical Society Ethics Committee. The Teaching of Mathematics journal does not have any article processing charges (APCs) nor article submission charges nor publication fee. The journal is fully Open Access and it is also available through Electronic Library of the Mathematical Institute SASA.